For those intested, here’s the “backstory” of how OC Talk Radio began. I belong to a group called CRITICAL MASS FOR BUSINESS. It’s a facilitated CEO PEER GROUP that meets once a month for 4 hours. The group is limited to 12 members, all of whom own similarly sized businesses in non-competeing industries. Our typical agenda starts with a recap of what happened to all of us over the prior month including reports on whatever we did (or didn’t do) to implement the suggestions, ideas and “action plans” from our last meeting. For many of us (me included) this “accountability to someone other than yourself” may be one of the most important features of this group. We’re all entrepreneurs, not used to reporting to anyone but ourselves. The problem with that approach (however) is that it’s far too easy to make excuses or put off painful decisions when there is no one looking over your shoulder, prodding you to improve and move forward. “I’ll do it tomorrow” too often means it never gets done. This is the magical “mastermind” part of the meeting: 12 individual minds coming together as one urging, adding to and otherwise improving upon each previous thought. Organized brainstorming, proving once again that the sum is greater than the individual parts. How can this help? Well, it’s hard to describe unless you’ve experienced it. But let me say that (in my own case) it gave birth to a whole new business. I was a long time PR person whose core clients (billiards, hot tubs and other home improvement products) had seen a dramatic decline during the recent “Great Recession”. Hot tub sales alone fell by over 70%. So, one by one, my clients were either going out of business or cutting back dramatically on their overall marketing services (including me). I entered the group to find a way to revitalize my business. Instead, the group opened my eyes to a whole new business opportunity. As I recanted my problems to the group and discussed how foolishly I’d put all my “eggs in one basket” (by narrowly focusing on just one niche), how “fat and happy” and complacent I’d become in the process and how I’d generally stopped learning, growing and aggressively marketing my services to others, it became clear that I needed a new fire or passion to prod me in a new direction and a distinctive service to offer. Then, after casually mentioning that PR companies were being asked (more and more) to take on the role and responsibilities of “social media strategist” for their clients (since ad agencies-used to making ads–and marketing people-used to collecting and analyzing data–neither knew how nor wanted to explore this new aspect of marketing), the group started prodding me to explore this subject and educate myself on this opportunity. That led to long discussions about “what is social media”, “how is it different than traditional advertising, PR and marketing” and what is its fundamental purpose? That, in turn, led me to some remarkble insights such as “social media isn’t an ad on the Internet”. People don’t just read your blog or “tweets” and buy. Instead, its something we’ve never seen before. The purpose (and promise) of social media is that it allows you to start a conversation with anyone you want to meet, from which you can learn, explain, explore and otherwise engage them in a meaningful dialog in which (hopefully) both sides receive some benefit. That means you can’t just “ask for the order” anymore. You have to be willing to offer some ideas and information for free, upfront, before you start the sales process. Information that your audience (hopefully) will find so interesting and informative that they pass it onto others in their network and community (creating “brand advocates” or “viral marketing” for your goods or services in the process). Then you have to respond to their questions and comments and keep them coming back for more. In other words, you have to have something interesting to say and then keep saying it regularly and often. That’s why most social media programs fail. Most companies aren’t prepared to become their own media production companies. They run of out meaningful things to say and they don’t regularly keep at it, primarly because it takes time and discipline and it may not show immediate ROI. And quite often, no one in the company is prepared to take on the additional role of “social media spokesman”, which is why it defaults to the traditional PR people (who are used to regularly speaking for their clients). And that’s when it occurred to me. This is what I should be doing, particularly since I originally started off in radio broadcasting and communication right after college (as a traditional DJ on WMYK, “K94″, in Norfolk,Virginia). Then came the even bigger insight that “I think I know a simpler and more powerful way to do this!” For if the purpose of social media is simply to start a conversation with someone you want to meet, then what could be easier than simply calling them up, interviewing them over the phone and then streaming that conversation live to the world? You could even record, archive and store it on some server, making it available 24/7 as a download for others to listen to and enjoy later as a “podcast” on ITunes and elsewhere. Wouldn’t that be much easier to produce than trying to research and write a new blog or mini-article each week? And (ultimately) wouldn’t it be much easier for your audience on the Internet to consume (given the fact that most people would rather watch or listen to something on the Internet than read it?) And wouldn’t these weekly live conversations be more interesting and stimulating than just talking to yourself ? (a problem that plagues most other social mediums like blogs, tweets and traditional podcasts) And wouldn’t a live, weekly broadcast, at a regular time and place, be more likely to engage your audience, particularly if they could call-in their questions (just like any traditional talk show) or log-on, in real time, and tweet their comments ? And wouldn’t your guests immediately tell all their friends, customers and clients to listen? And wouldn’t they put a link to that recorded interview up on their site after the fact (which would help drive traffic and links to your site, thereby raising your search engine rankings and giving you a free ad on their website forever?) The answer to all this was “yes”. 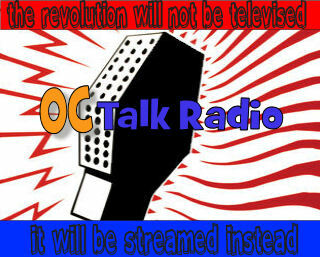 Thus was born a new “social medium” and the business to go with it: OC TALK RADIO, Orange County’s only community radio station giving local businesses a voice on the Internet. For more information, check us out at http://octalkradio.net.